This article was originally posted on workforce.org. 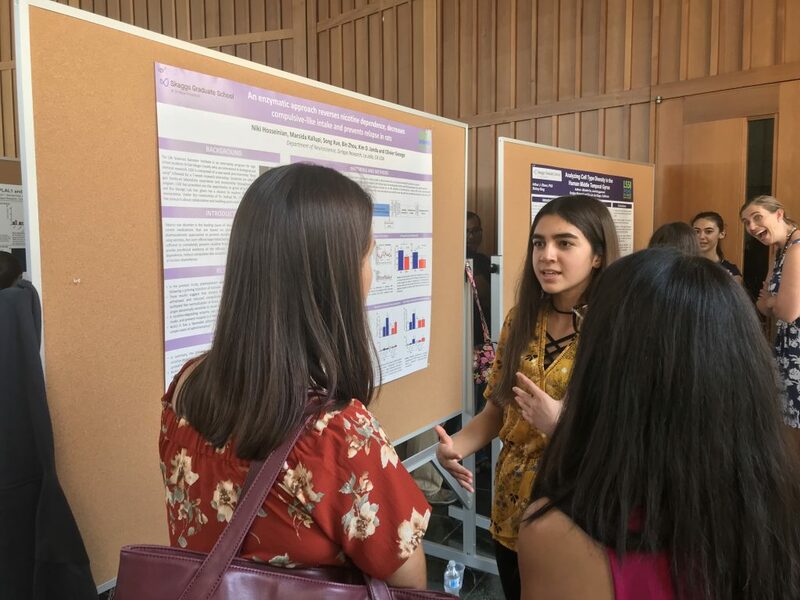 This summer, the Life Sciences Summer Institute (LSSI) made it possible for more than 30 young adults to complete internships at nine of San Diego’s top research institutes, including the Salk Institute, the Scripps Research Institute (TSRI) and UCSD Academic Connections. This marks the 13th successful year of LSSI, a prestigious internship program for high school students run by the San Diego Workforce Partnership (SDWP), which seeks to identify and advance San Diego County’s next generation of scientists. The program officially wrapped on October 9 with a graduation celebration at Biolabs. Attendees mingled with LSSI interns and heard about their various summer projects while viewing their scientific posters. Key LSSI partners, including Councilmember Barbara Bry and Christy Aurigemma from Pfizer shared their enthusiasm for the program. Since 2005, LSSI has served 595 future scientists and researchers as they take the first steps towards actualizing their career aspirations. In partnership with the Southern California Biotechnology Center at Miramar College, the program opens with a weeklong intensive boot camp where interns learn the skills that are crucial for success in the lab. The boot camp is followed by a seven-week paid internship where students have the opportunity to work directly with scientists and researchers on real world research projects. This year, projects included an analysis of cell type diversity by Michelle Fox, a study of neurogenesis by Sebastian Penalosa and a study of qualitative analysis techniques used to separate and purify chemical compounds by Roda Nour, among others. 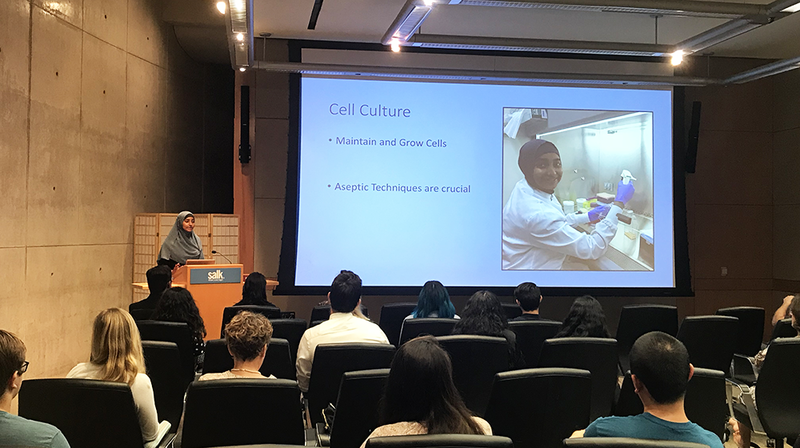 Sebastian, who studied neurogenesis in the Gage Lab at the Salk Institute this summer shared that before he went through LSSI he was unsure of whether he wanted to pursue a career as a researcher in a lab or as a doctor in private practice. After spending seven weeks in the lab, he realized that the work was not for him and is now confident in pursuing a career as a doctor. It’s this kind of career exploration that helps young adults recognize their strengths and weaknesses, likes and dislikes, leading to more informed decisions about their education career path. Regardless of where their career path is headed, the value that real world experience as they begin their careers was felt across the board. Having the opportunity to learn both technical and soft skills in a work environment has made a huge impact on the LSSI graduates, giving them the tools and experiences they need to achieve their career goals. “What LSSI does here with students, allowing them to get real world, hands on experience, meet professionals and learn from some of the best, is absolutely essential and phenomenal,” says Nour. We are so proud of our 2018 cohort and can’t wait to see where their career journeys take them. The LSSI application for summer 2019 will open in mid-January. Please check the LSSI webpage for updates or contact penelope@workforce.org for questions.